Largashbur is an accursed Orc stronghold in the Rift beset by giants. 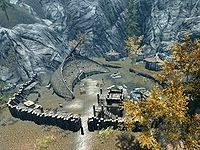 It is located southwest of Riften, against the mountains, east of the Dwemer ruin of Avanchnzel. It contains a makeshift altar to Malacath, adorned with a full suit of Orcish armor and lavender. Largashbur Longhouse - Primary dwelling for all residents. Apothecary's Shack - Exterior building with an alchemy lab. Blacksmith's Shack - Exterior building with a forge, workbench, and grindstone. Tanner's Shed - Exterior building with a tanning rack. The Cursed Tribe: Help lift the curse placed on the Orcs of Largashbur by Malacath. Lob, Ogol, Ugor, and unnamed Orcs outside stronghold are not essential and can be easily killed by invading giants, even before you arrive to the scene. After completing The Cursed Tribe, Lob, Ugor, and Ogol can be recruited as followers. Giants will continue to occasionally attack the stronghold after the quest The Cursed Tribe has been completed, as the disable flag is not implemented. This can eventually result in the death of everyone within other than Atub. The giant attacks can be stopped by opening the console and entering the code "000A0E72".disable. This page was last modified on 8 March 2015, at 22:58.